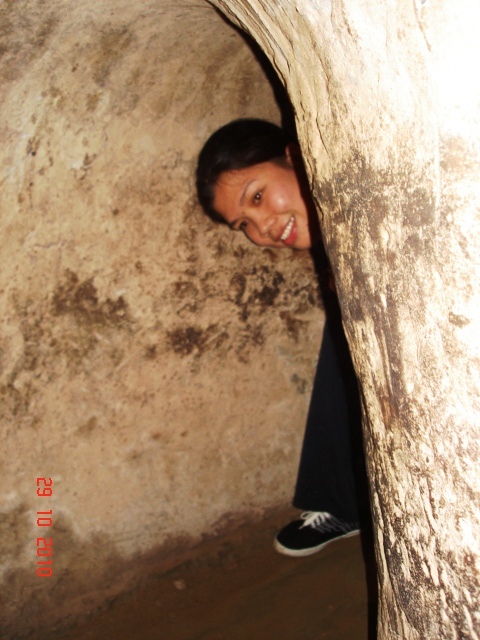 We were referred yesterday by our hotel attendant to a tour operator for our Cu Chi Tunnel Tour. Tours offered are either in big groups (in a bus) or small groups (in a van). For this one, we chose the bus which costs only USD5 per head. The fee covered the two-way transportation, the English speaking tour guide, a quick drop by to a lacquer workshop along the way, and complementary bottled water. 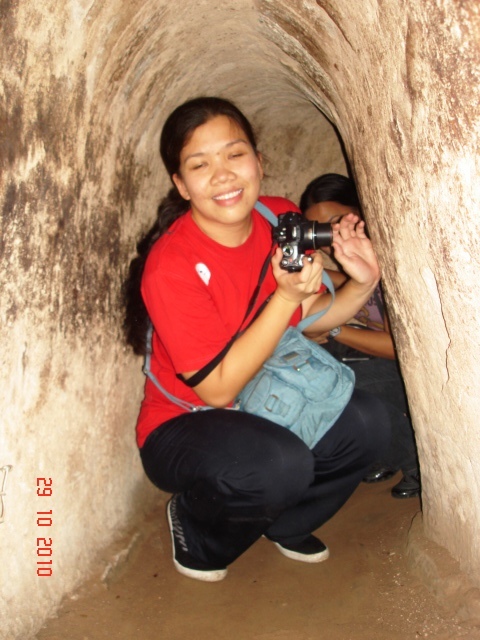 From Wikitravel: Cu Chi Tunnels is located 40km northwest of Ho Chi Minh City. The tunnels are an elaborate underground community made up of 250km of tunnels and chambers below the city. 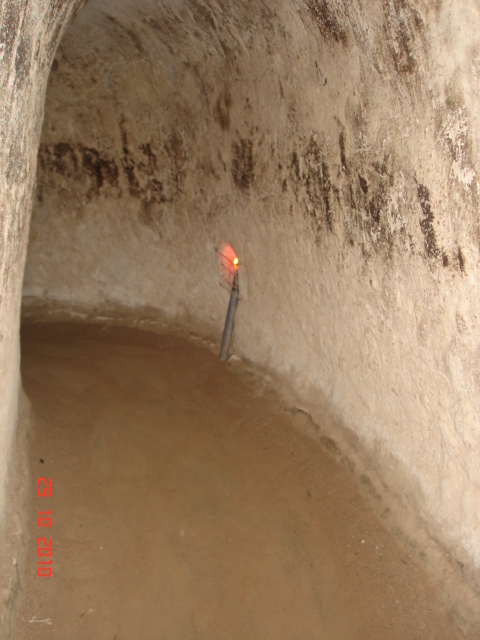 The tunnels were dug with simple tools and bare hands during the French occupation in the 1940’s and further expanded during the Vietnam War in 1960’s to provide refuge and a defensive advantage over the American Soldiers. So despite all the bombings in South Vietnam, the Cu Chi people were able to continue their lives beneath the soil – where they slept, ate, wed, gave birth, planned attacks, healed their sick and taught their young. We arrived at the tunnel past 11 in the morning after a 1-1/2 hour travel. At the entrance, we were oriented with the rules, the restricted areas, and of course our time limit. 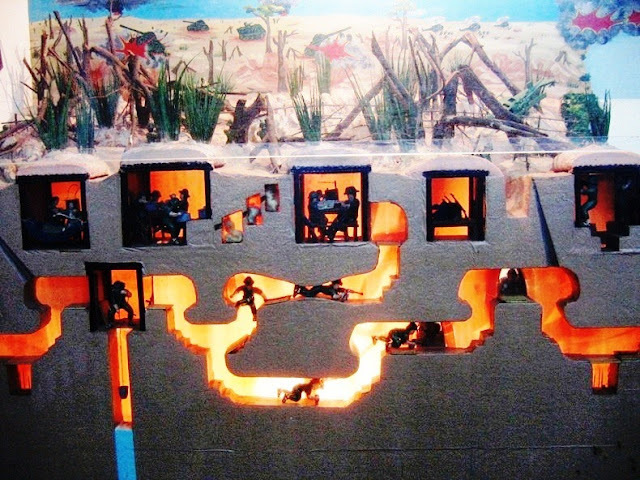 The picture above is a demonstration of how the Vietcong hid underneath or take a peek of the outside through a small opening covered with leaves. Plenty of those are scattered all over the area. The pictures below are other forms of entrance and exits as well as the traps and decoys that were carefully planted as early form of defense. The dining bunker and workshop area. The tour allowed us to crawl around in the safer parts that are partially illuminated with low-powered lights. After our actual underground experience, we were allowed to wander on our own for a short while. There were plenty of souvenir shops but I found the one near the shooting range as the most budget friendly. I bought a wooden carved flower vase and a small wooden pot with Cu Chi Tunnel engraving for my keeps.